Good news! Your dog can dress to impress, whether attendance to a formal dinner, dance or even a wedding. Maybe Mr. Whiskers wants to show off for that pampered Poodle next door. Or maybe Ms. Tuftsy is going on a date with that dreamy German Shepherd down the street. 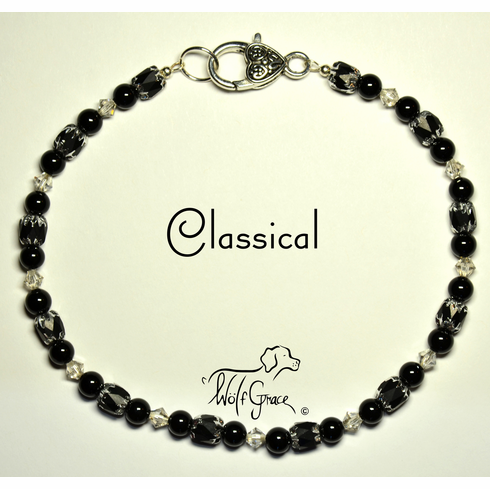 Either way, your dog can fit in while totally standing out at any event with this elegant and timeless Classical necklace. The simplicity and versatility of the 8mm Cathedral Czech Glass comes by its name honestly, as it shimmers and reflects like a beautiful cathedral building. Surrounded by 6mm round Onyx and 4mm bicone Crystal Satin Swarovski, this necklace will dazzle all who catch a glimpse of your dog. No necklace is complete without being strung on Sterling Silver jewelry-grade wire. Notice on each end of the necklace, how the Sterling Silver crimp covers reinforce and conceal the Sterling Silver crimps, which hold the beads securely in place. 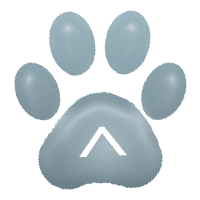 We would be lying if we didn't raise our paws and say "one of the favorites" here at W�lf Grace.